I consider myself something of a pushchair aficionado. Much like after the summer I spent selling sunglasses when I couldn’t help but check out what shades everyone was wearing (I can still identify a pair of polarised Oakleys at 20 paces), since becoming a mum, I can’t resist eyeing up what wheels fellow parents have chosen. My husband is much the same. He loves research and an Excel sheet, so when it came to preparing for our first baby, he put himself in charge of what we’d be pushing. Now, as we prepare for our second child, I can look back and have more knowledge about what I’ll need, what’s unnecessary and what I can only dream of (namely Sudocrem that comes in a spray so it doesn’t get EVERYWHERE). Armed with these insights, I was excited to try out the newest stroller on the block. 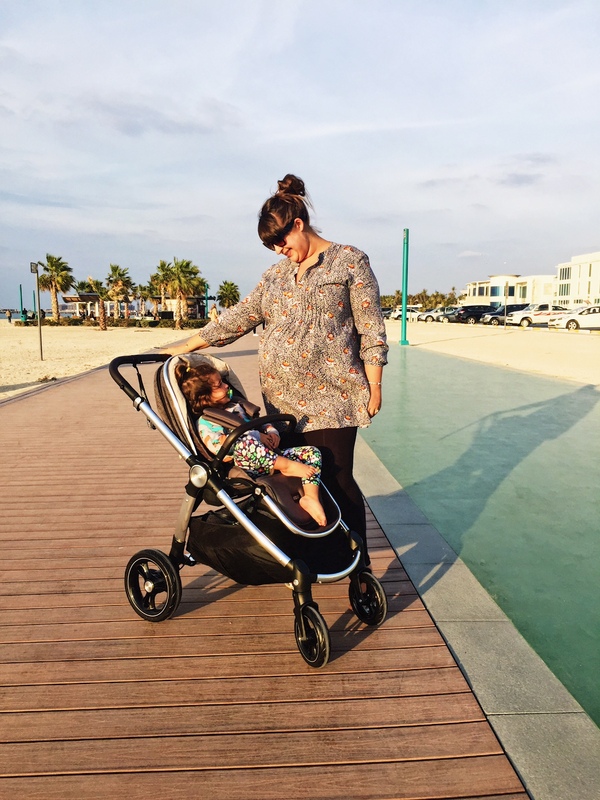 Mamas & Papas’ Ocarro pushchair is already a massive hit in its native UK, and has just launched in the UAE, available in-store and online. So what’s the fuss about? 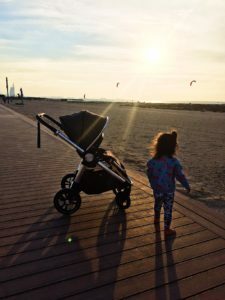 Bringing together some of the most successful features from other strollers in the fleet, such as the Armadillo, the Ocarro is a real crowd-pleaser. It looks good (actually, it looks great, with lovely colours such as sage green and chestnut, plus metal accents and leather trim for an indulgent feel) and performs really well. 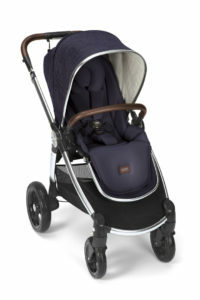 Suitable from birth to 15kg (the average three-year-old), it’s one to keep in the family. The all-terrain wheels and dual suspension make for a smooth ride, whether you’re in the mall or off-road, and there are special touches like plush cushioning for your baby’s comfort. It’s all very… smooth. It’s robust, but doesn’t feel over-sized. It’s luxurious, but design and functionality haven’t been compromised. I love that the well-padded seat reclines fully – perfect for newborns, though there’s a carrycot option available too – and it can face forwards or towards you. A supersized three-panel canopy is ideal for the sunny UAE (seriously, it’s huge) and there’s even a mesh panel at the back for air circulation on hot days. Other features that I rate included the adjustable handle for taller parents, a large, easy to access basket underneath (no awkward wrangling of shopping bags as you shove them in) and the flip-flop-friendly brake. Not to be underestimated in this part of the world! In terms of putting away, there’s no need to remove the seat – it folds forward, then there’s a handle you can use with one hand to effectively half the stroller’s size. This method also protects the fabric of the seat, which is great if you’re putting it on the floor or into the back of a not so clean car. 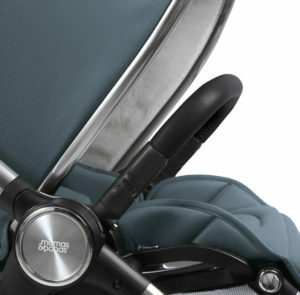 The Ocarro is also compatible with car seats, including models by Chicco, Maxi-Cosi (we have the Cabriofix and it was really easy to pop on the frame using an adaptor), Cybex and Gracco. There are, of course, a couple of features that didn’t work for me. It’s definitely on the heavier side at 13.5kg, but that’s the price you pay for the sturdy frame and metal details. It’s certainly comparable to my old stroller on that front, and given the choice I’d rather a big of extra heft than sacrifice a comfortable ride for my baby. The five-point harness took a little getting used to, but I’m in the midst of baby brain and after popping Phoebe in and out of it a couple of times I had it cracked. The Ocarro is a real head-turner, but it’s practical as well as stylish. The colours are gorgeous, the little luxury touches make it feel far more expensive than it is (bonus) and there are details that really show how well thought out the design is, such as reflective trim for visibility at night and the head hugger for younger babies. I also really liked that it’s compatible with some of the most popular car seats on the market, so you don’t need to change your existing travel system. Above all, though, it feels really smooth and comfortable, for both the little one and the parent. There are no clunky features, folding and unfolding is easy, and it handles so well. It’s smart, in all senses of the word, and is a real contender when compared with some of the big name brands. And with a smaller price tag. As for my daughter’s verdict? She keeps saying ‘Nice nice nice!’ whenever she sees it, and tries to climb in, so I think that’s a hit! Available online at Mamas & Papas and in stores across the UAE, priced from AED3,499. You might also enjoy… Tried and tested: Privilee beach club membership. Fabulous review, and very detailed. I’ve been too’ing and throwing between this and the “urbo 2”. Think this review just helped me make up my mind. 😊 Thanks!